W. George Lewis’s company built 5 Cranbrook Villas, London Road, Buckland, where he lived. In fact, his company built many of the late 19th and early to mid-twentieth century houses in that area. William George, or George or WG, as he seems to have been personally known at the time, was born on 16 May 1850. His father was a bricklayer living in Charlton and WG married Ann Maynard, in Dover, in 1871. Three of their children, two girls, Ellen and Alice and a boy, George Frederick (known by his middle name), survived to adulthood. WG was said to be a genial man and noted for his love of flowers – he always had one in his buttonhole except when wearing his chain of office as Mayor. Establishing his building business in 1879, when Dover was rapidly expanding, the firm’s headquarters was in Lewis’s Yard, Widred Road, Tower Hamlets. The site is now a small housing development. As WG’s business grew so did his reputation and in 1898 he won the contract to build Barton School. This was to accommodate 440 boys, cost of £3,500 and the Boys’ school eventually opened at the end of January 1903 for 240 boys in four classrooms. 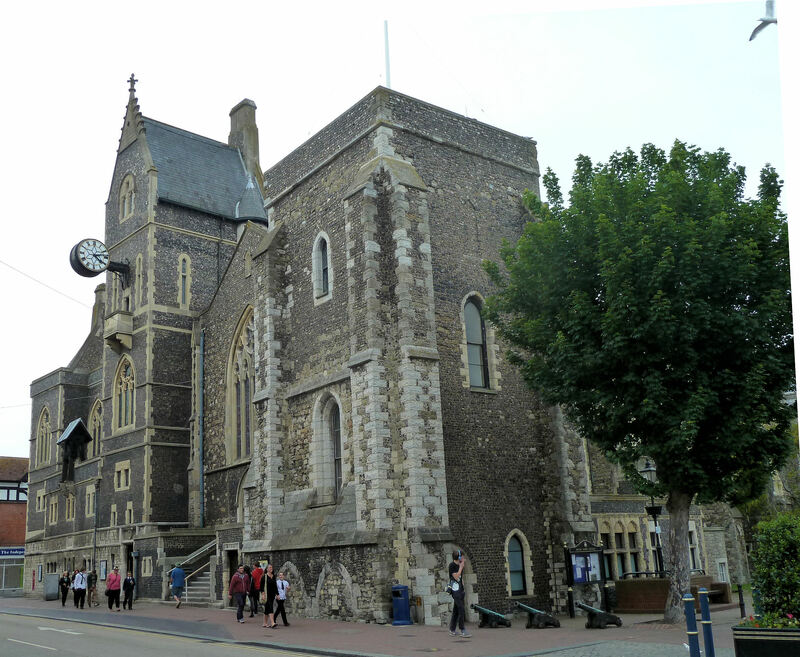 The funding was provided through charities connected with St Andrew’s Church, Buckland but was later Dover Corporation purchased the school. In 1891 WG, who regularly attended St. Andrew’s Church, was appointed a churchwarden – a position he held for the next 34 years. In November that year he stood, unopposed, for the Town Council representing Castle Ward. 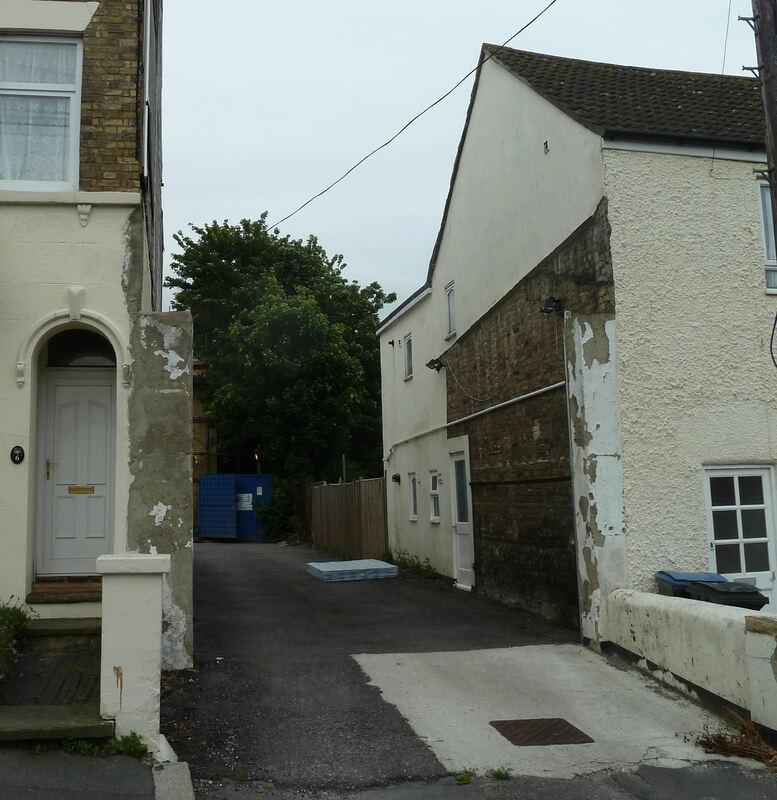 At the time, the Ward had 4,362 electors and stretched from the seafront along the Dour almost to River. It was represented by two seats on the council. Two years later WG fought the first of two elections that were contested. The first was a three cornered fight for the two seats with WG and another Conservative against Independent, Ernest Chitty. Both WG and Chitty were elected. In 1897 and 1900 only two candidates stood, WG and another Conservative. The 1904 election was the second one WG faced opposition and it was also the one that led to an official Hearing into the Great Dover Scandal! To understand how this came about, we need to go back to the beginning of the nineteenth century. At that time, there were very little educational facilities for the poor folk of the town. However, as the century progressed, the Anglican Church provided most schools for the poor. Following the Elementary Education Act of 1870, the government provided grants for elementary education but in Dover, the School Managers could not see the necessity of applying. The Church of England Schools Company was set up and raised funds for the building of Granville Street Boys’ School (1875), St Bartholomew’s School (1881), Charlton Girls’ School (1882 extended 1898) and the one that WG built, Barton Road Boys’ School (1898). However, before the century was out an independent report stated that there was insufficient accommodation in Dover schools to meet government requirements. The schools in existence were poorly equipped, lacked playgrounds and were deficient in sanitary arrangements. The council was obliged to rectify matters. Of note, in 1871 the Roman Catholic Church in Maison Dieu Road had a school attached and in 1901, the Methodist Church in London Road opened with a school attached. Neither of these came in for criticism. The 1902 Education Act established countywide Local Education Authorities (LEAs) in order to unify the elementary school system and Dover received a grant of £10,000 from the Kent LEA. With it came the recommendation that the council, through the rates system, provided a further £2,500 to bring Dover schools up to standard. 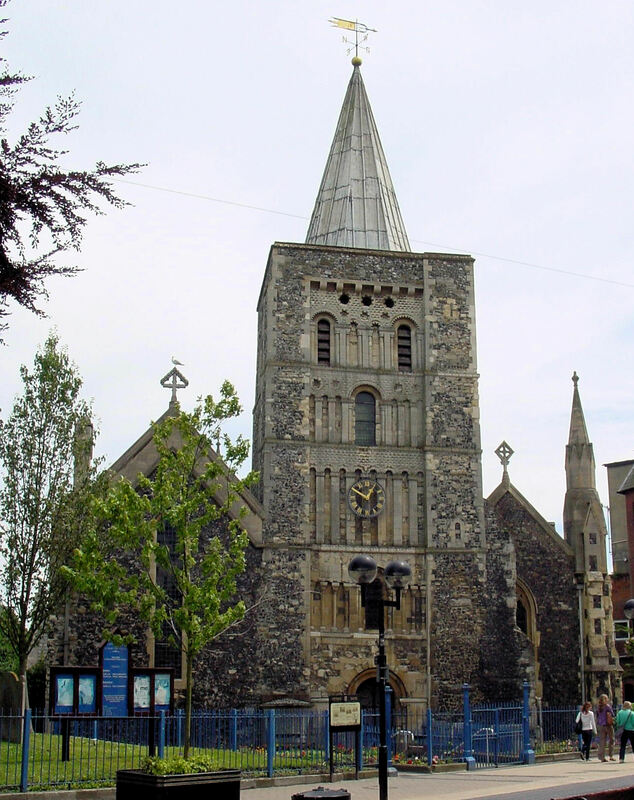 St Mary’s Church, Cannon Street. There was an immediate and loud public outcry and when the Rector of St Mary’s Church recommended that a further £9,000 should be raised to build new schools at Elms Vale and at Buckland, he was advised to take a rest. He was then packed off to the south of France! Nonetheless, the LEA agreed with the Rector and Dover Corporation was obliged to set up the Municipal Education Committee (MEC). They were to oversee the provision of elementary schools for 600 children up to the age of 13 in the Elms Vale area, 300 infants in the Buckland area and 50 places in the Pier District. At the time, the Conservatives were in power and headed by Sir William Crundall (1847-1934). The Church of England Schools Company built Barton Road Infants (1902) and St Martin’s, Elms Vale (1903). These were classed as Church schools under the new Education Act even though administered by the MEC. The cost to the ratepayers of Dover was about 2d in the £. This, in itself, caused another public outcry that was only alleviated when the MEC announced that all head teachers in the borough had to be practising Anglicans and religious instruction was to conform to Anglican teachings. The reaction to this was a furore of indignation by Dover’s Roman Catholic and Nonconformist communities … but this was ignored. Ernest Chitty, who had been elected as an Independent with WG in 1893, was also a local solicitor and an active Nonconformist. He set up a local paper called the Dover Times, in which he implied that the Conservatives, whom he referred to as the Crundall Party, entertained corrupt practices. He hoped that Crundall would sue so that he would be able to put over the frustrations of the Nonconformists in court. Crundall did not rise to the bait. On 2 November 1904, municipal elections were held and WG stood for the Crundall Party in Castle Ward along with fellow Conservative, Arthur Walmisley. At the time, they were deputy Mayor and Mayor respectively and it was expected that the election would again be uncontested. However, at the last moment Ernest Chitty and Henry Edwin stood as Independents. Chitty was beaten by 24 votes and Edwin by 262. Immediately, Chitty lodged a petition alleging that WG and Walmisley, by their agents, were guilty of questionable practices and claimed he had 200 witnesses. The practices he referred to included the, ‘illegal use of conveyances, bribery and treating’. Although accused of ‘malicious jealousy’ by the Crundall Party, (a phrase still favoured today by Dover’s local politicians against their adversaries), Chitty pursued his claim. The Government appointed George Sills, the Recorder of Lincoln, to Hear the case and because of the seriousness of the allegations, a Public Prosecutor was also appointed. Former Dover Town Hall where the Hearing took place. The Hearing took place at the then Town Hall, now the Maison Dieu, and lasted three days. It was well reported. Chitty stated that voters were given 2s (10p) to go to polling stations in carts covered with posters of the two Conservative candidates. These voters were picked up from Yeoman’s barber’s shop, 105, High Street; Primrose Hall, Union Road; Imperial Crown Inn, Tower Street and the Tower Inn, West Street. None of the witnesses denied this; indeed their main contention was that they had been under-paid compared to previous occasions! It was evident that bribery was standard practice and Commissioner Sills found that bribes had been given in 43 cases. He declared the election void and both WG and Walmisley were barred from holding municipal office for three years. The verdict appalled locals, not because of the scandal but because bribery was no longer allowed! They made there anger felt at the following bye-election for Castle Ward on 25 February. Chitty and Edwin were soundly thrashed by two new Crundall candidates. In the meantime, Sir William Crundall filled the post of Mayor. WG remained a prominent member of the Dover Conservative Party and on the death of Alderman William Adcock, in 1907, he was elected Alderman. He remained an Alderman until November 1922 so never had to stand for election again. During those years WG was the Chairman of the Public Health Committee and, for a period, Chairman of the Overseers. He was also appointed a Municipal Charter Trustee, a Manager of Buckland, Barton Road and Charlton Schools, and a member of the Dover Elementary and Higher Education Committees. As a member of the Committee of Dover’s Gordon Boys’ Orphanage, WG helped to reorganise the institution and in 1922 was appointed a Justice of the Peace. In November, that year WG was elected Mayor but his year in office was first marred by the loss of his wife Ann, on 12 January 1923. Then there was the Pencester Meadow controversy. At the time the country was faced with high unemployment and the Government were providing funds for council sponsored projects that provided work. The previous year the Council had agreed to purchase the 3½acres Pencester Meadow in order to provide work as they had already purchased the adjacent Stembrook tannery site for approximately £1,100. Together with the Meadow, they reasoned, the whole area could be laid out as a municipal park. The Meadow was advertised to be sold at auction on Thursday 23 November 1922, just after WG had been proclaimed Mayor. However, the Council did not have any money of their own to put in a bid. They rationalised, on the basis that due to the high level of unemployment in the town, the Ministry of Health would provide an unemployment relief grant. Thus, they agreed to put in a bid and hired a man to act incognito on their behalf. His remit was not to exceed £3,500. At that time, the Ministry of Health was the department that handled the Unemployment Relief Fund. At the auction was local business man and keen aviator Murray Armstrong Payn (born 1909), who was also interested in the site with the two men bidding against each other until the Council’s agent backed down at £5,000! Payn, on realising what had happened, offered to sell the land to the Council for the amount he paid but as they did not have the money, they put in a request for a grant to the Ministry of Health for £7,920. That was £5,000 for Pencester Meadow and £2,920 for it to be laid out. WG reasoned that the Health Minister, Sir Arthur Sackville Trevor Griffith-Boscawen (1865-1946), as a fellow Conservative, would look kindly on the project. However, there was strong local feeling against purchasing the Meadow so Griffith-Boscawen ordered a Public Inquiry. This was held on 16 March 1923 in the then Town Hall, where the earlier Hearing had taken place, and Inspector M K North presided. The editor of the Dover Express, Russell Bavington Jones (1875-1949) led those who opposed the project. Angry exchanges had taken place in the paper in the weeks before, during which it emerged that the former Dover Mayor – thirteen times and the then present Chairman of the Dover Harbour Board – Conservative Sir William Crundall was the sole owner of the land. This tainted the whole project as being corrupt. However, at the Inquiry Ernest Chitty supported the Council’s stance on purchasing Pencester Meadow and made that clear. Bavington Jones then argued that money would be better spent on paying the unemployed to repair the town streets that were in a bad state of repair. 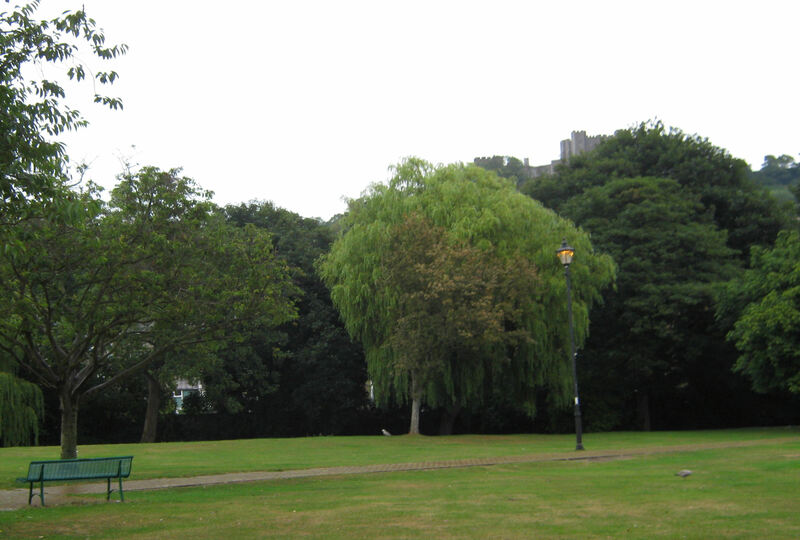 He pointed out that WG had been particularly persistent in saying that the Meadow was required as an open space for the town’s children, when Dover had a long Seafront and beaches for them to spend their leisure time. He also went into detail on the underhand way the Council had put in their bid for the Meadow, which had pushed the price up. This, he stated, had provided a handsome profit for Crundall. The auction aspect provoked a rebuke on the Council from Inspector North. 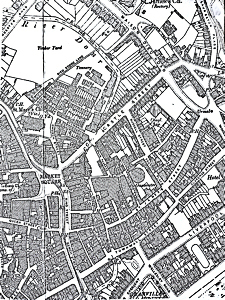 Map of 1890 showing the density of the housing in central Dover, that had not changed much by the time of the Inquiry. On the stand, WG, as Mayor, acknowledged that the Council were wrong in the way they had bid for the Meadow but pointed out that unless they actually owned the land, they would not have been eligible for a Grant from the Ministry of Health. This was required to provide the much-needed jobs, further, Payn had agreed to sell the Meadow to the Council for the price he paid – £5,000. Therefore, the loan the Council was applying for was to purchase the land in order to provide work for 50 unemployed men for three months. WG went on to say that Pencester Meadow was the only green space in an area of high housing density. At the time the area from Dieu Stone Lane to the Seafront, from Pencester Road to the bottom of Crabble Hill and from Biggin Street westward, including Mount Pleasant and Tower Hamlets, were all densely populated. This, he stated, adding that the elementary schools serving those areas had extremely limited amount of playground space. Thus the Meadow was needed as a future playground for the children from those areas. WG went on to say that employing locals to create this pleasure facility was far better than the men and their families clogging the streets begging for food and money. Further, if the men still could not find paid employment when the project was finished, then they could be employed by the Council to mend streets. This though, he said, would mean the rates would have to be increased to pay their wages, whereas a loan for the Pencester Meadows project would include the men’s wages and spread the repayments for the cost of the purchase and laying the grounds, over a number of years. Finally, WG acknowledged that Dover did have a long Seafront but added that the War Department had laid the Seafront Railway in 1918. Following World War I (1914-1918), the Dover Harbour Board had taken over the Railway with the intention of covering the Seafront with docks, warehouses and industrial developments along its course. Although this was confirmed by Crundall, it raised loud heckles from those who opposed the Council project especially as the Inspector appeared to indicate that he was not convinced. Inspector North’s decision, on behalf of the Ministry of Health was published before the end of April 1923 and gave approval to the project. This included the provision of a £2,900 loan repayable over 20 years in order to lay Pencester Meadow out as a play area and gardens. Consent was also given for a £4,200 loan, repayable over 50 years, towards the £5,000 cost of buying the Meadow. Bavington Jones probably correctly interpreted this as the Inspector telling the Council that he did not approve of the way they had tried to purchase the land in the first place. Although WG and the Council were jubilant they still required £800 to purchase the site. Over this, Payn came to the rescue by suggesting that the Council paid him £4,200 for the Meadow and the outstanding amount over the following eight years. WG, on behalf of the Council, accepted the offer and it was expected that work would begin. However, when the Council received the details of the land they had bought, it transpired that Crundall’s agents had included Pencester Road in their measurements! After heated negotiations with both Payn and Crundall’s solicitor, Crundall refunded £600 and work began on what was renamed Pencester Gardens in 1924! 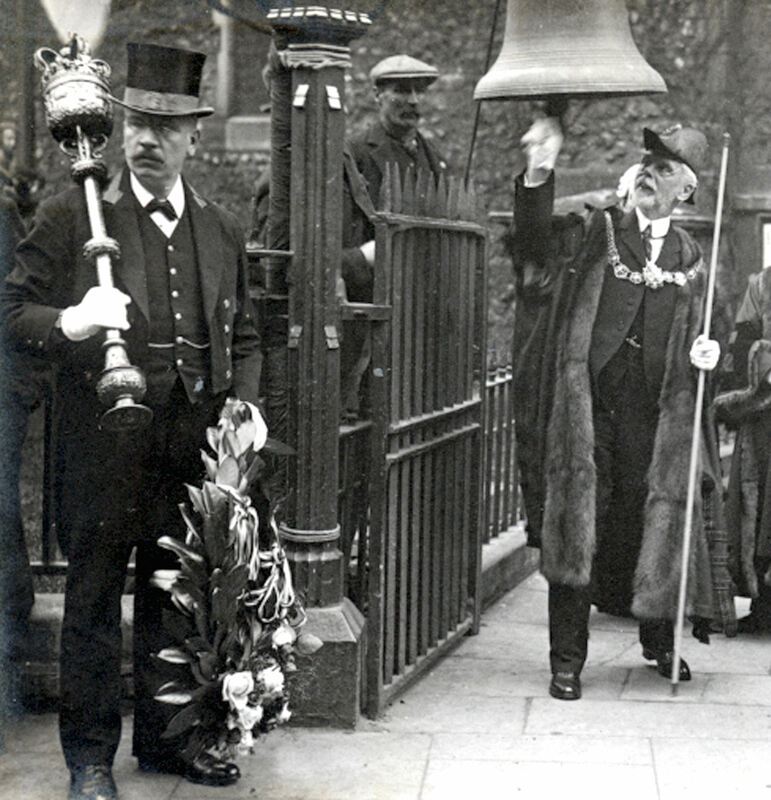 On 23 April 1923 WG rang the Dover Patrol’s Zeebrugge bell housed under a canopy outside the front of the then Town Hall, now the Maison Dieu. This is an annual event held in Dover in memory of daring raids on the Belgium Zeebrugge and Ostend outlets of the Bruges U-boat base during World War I. Shortly after, he became seriously ill requiring an operation that was carried out at the Dover Nursing Home, Coleman House, on Brookfield Avenue. Following a short convalescence WG returned to his official duties but remained unwell. 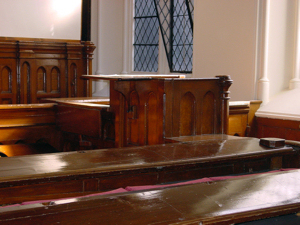 Witness stand in the former Court Hall in the Town Hall now the Maison Dieu. Alan Sencicle. In November 1923, the Mayor’s Badge of Office was handed over to Richard John Barwick (1875-1966) and in February 1924, WG was given the town’s highest honour. He was made an Honorary Freeman but on Easter Monday, while sitting as a Magistrate in the very Court where both Inquiries had taken place, he complained of a cold. The following day his condition deteriorated. WG died on 2 May and is interred in the family vault at St Andrew’s Church, Buckland. Following WG’s death, his old adversary, Ernest Chitty, gave a moving speech in which he described him as a most kindly and courteous man and that he knew privately of WG’s many benefactions and kindness to the poor people in the town, including providing work for the unemployed. 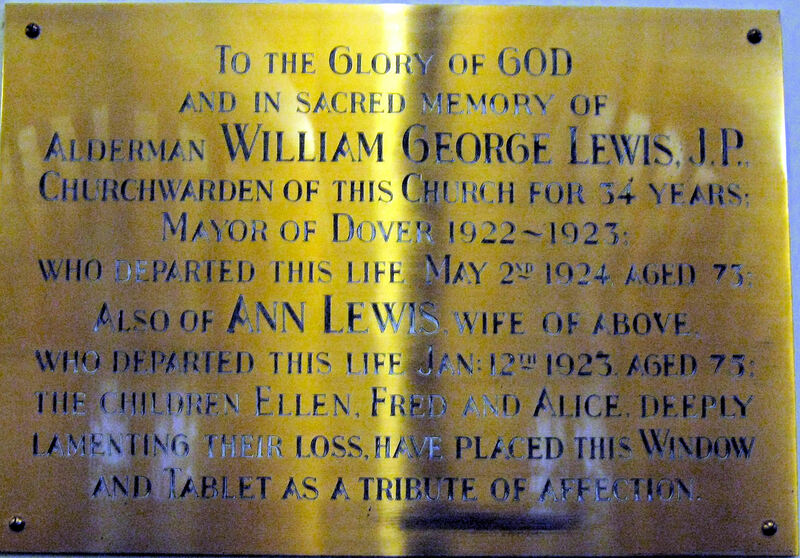 This entry was posted in Businesses, Lewis W George - Building Contractor, Lewis W George and the Great Dover Scandal, Local Government. Bookmark the permalink.